Absorbing - The assimilation of one substance to another in which the identity of the substance taken in is transformed or lost. Acerbic - A term referring to a taste fault in the coffee brew that leaves an acrid and sour sensation on the tongue. Acidity - A basic taste characterized by the solution of an organic acid. A desirable sharp and pleasing taste particularly strong with certain origins as opposed to an over-fermented sour taste. Add-on sale - Term referring to coffee sold as a second beverage to increase check averages. Adsorbing - The adhesion of an extremely thin layer of molecules (as gases, liquids, or solids) to the surface of the liquid or solid bodies with which they come into contact. Aerate - To expose a product to air. Aftertaste - The sensation of brewed coffee vapors in the mouth, released after swallowing. American roast - An even chestnut brown color; pronounced caramel-like flavor with no trace of a dark roast (burnt/smoky) flavor. Animal-like - This odor descriptor is somewhat reminiscent of the smell of animals. It is not a fragrant aroma like musk but has the characteristic odor of wet fur, sweat, leather, hides or urine. It is not necessarily considered as a negative attribute but is generally used to describe strong notes. Aroma - The fragrance or odor perceived by the nose. In coffee, aroma refers mainly to volatile components released from brewed coffee. Aromatization - The process of adding back to soluble coffee many of the aromatic flavor compounds lost in the brewing or drying process before con- version to a soluble form. Ashy - This odor descriptor is similar to that of an ashtray, the odor of smokers' fingers or the smell one gets when cleaning out a fireplace. It is not used as a negative attribute. Generally speaking this descriptor is used by the tasters to indicate the degree of roast. Aspiration - Drawing coffee brew into the mouth by vigorous suction and spraying it evenly across the tongue to release gases. Aspiration provides for a better sensory evaluation. Barista - A person who makes coffee drinks for a living. Basic tastes - Sweet, sour, salt, and bitter, respectively characterized by sucrose, tartaric acid, sodium chloride, and quinine. Best value blend - The medium-priced blend typically used by restaurants, businesses, schools, and government institutions. Beverage yield - The amount of fluid output of the brewing equipment, based on coffee-to-water ratio. Bitterness - A primary taste characterized by the solution of caffeine, quinine and certain alkaloids. This taste is considered desirable up to a certain level and is affected by the degree of roast brewing procedures. Black bean - A defect that occurs when the growth of the coffee cherry is arrested either through lack of water, lack of nutrients, inadequate pruning, disease, or insect attack. Black beans are only found in the lowest grades of coffee exported. Blending - Combining different coffees to achieve a desired price level, to achieve a desired flavor, or to maintain flavor consistency. 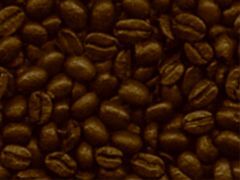 Blind item - Refers to a coffee for which the country of origin -of the beans or composition of the- blend is unknown. Body - 1. This attribute descriptor is used to describe the physical properties of the beverage. A strong but pleasant full mouthfeel characteristic as opposed to being thin. OR 2. The physical properties of the beverage as perceived in the mouth during and after ingestion. Boston Tea Party - The 1773 revolt against King George's tax on tea that marked the beginning of coffee's role as the United States' favorite beverage. Coffee replaced tea and symbolized support for the American Revolution. Bottomless cup - Expression referring to the policy of offering unlimited, free refills of coffee. Bouquet - The total aromatic profile of a coffee brew, created by the sensations of gases and vapors on the olfactory membranes. Breve - Espresso with steamed "half & half" or cream. Brew colloids - Micro-sized particles formed by different combinations of oil and water-soluble constituents that are suspended in brewed coffee. Colloids give texture (mouthfeel) and contribute to overall flavor. Brew turbulence - The agitation of the grounds in the coffee bed during the brew cycle, created by spray pattern, rate of water flow, and configuration of the brew basket. Brewing formula - Ratio of coffee to water used to produce the desired beverage strength from a specific type of brewing equipment. Burnt/Smokey - This odor and flavor descriptor is similar to that found in burnt food. The odor is associated with smoke produced when burning wood. This descriptor is frequently used to indicate the degree of roast commonly found by tasters in dark-roasted or oven-roasted coffees. References: International Coffee Organization, National Coffee Association, Oregon Daily Emerald, and the Specialty Coffee Association.